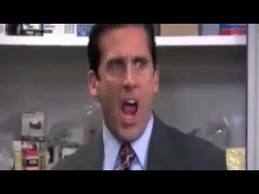 I Declare Bankruptcy!!! 1 easy step. Declare bankruptcy in one easy step! If you have every wondered what it meant to “Declare Bankruptcy,” this YouTube clip from The Office will provide you with a unique perspective! Well, if life could be so simple and easy as that! Very funny stuff. Ok, how to I really declare bankruptcy in Omaha? Initial consultation. Meet with an actual bankruptcy attorney in person to discuss your particular situation. Don’t waste your time meeting with someone that is not an attorney that is licensed in Nebraska and/or Iowa. The consultation is where the game plan is set if bankruptcy is right for you. If it is not the right option, you’ll know at the first visit which, by the way, is FREE! Gather together paperwork and documents. Yes, it takes a little time and effort, but it’s really not too much work. We will need your bills, pay stubs, bank statements, tax returns and a filled out questionnaire. Most people don’t have everything together, so there is normally a little digging necessary to get some of the information. However, there are work-arounds if documents just aren’t available. During this information gathering period, professional bankruptcy assistants and paralegals are hard at work helping as your personal assistant! Meet again with your Omaha based bankruptcy attorney. All of the documents will be prepared and ready for your careful review. During this appointment, your paperwork (called a Bankruptcy Petition) is electronically filed with the Court. There, you have DECLARED BANKRUPTCY! To Declare bankruptcy or not? That is the question. Declaring bankruptcy is not something to be undertaken without advice and counsel. It’s not for everyone but it is critically necessary and important for many people and businesses. Without bankruptcy as an option, lives would be forever ruined for many, especially in our current economic climate. The ability to work and provide a basic standard of living for yourself and your family wouldn’t be possible for thousands of people without the legal option of declaring bankruptcy.